Embark upon dangerous heists, avoiding traps, watchmen, hideous creatures, and fell sorceries in pursuit of treasures beyond your wildest dreams. 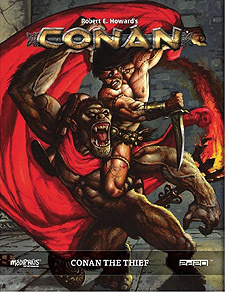 Work alongside legendary thieves of Conan's world, carrying out robberies worthy of their reputation, or work against them and take the riches of the world for yourself! Steal wealth beyond measure, avoid capture, and secure yourself a place in infamy! A gazetteer covering the locations of Conan's world, where thieves prosper and riches are there for the plunder! Detailed guides to the cities of Zamora, Shadizar, and others, revealing those places where thieves can find gold for the taking and refuge from the law.